:What's the point of studying philosophy when we have theology? Is philosophy anything more than a preparation for apologetics?Often called "theology's handmaid," philosophy has sometimes suffered from an inferiority complex in the church. Many Christians see little point in it at all. But as Paul Copan contends, it is possible to affirm theology's preeminence without diminishing the value and contribution of philosophy.In A Little Book for New Philosophers, Copan offers a concise introduction to the study of philosophy. 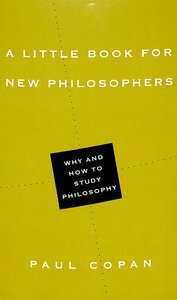 Aimed at newcomers, this brief overview is both a survey of philosophy's basic aims and categories and an apology for its proper function in the life of the Christian. "By God's grace," Copan writes, "philosophy can enhance our understanding and worship of God ... and assist us in defending the coherence of our faith in the Lord Jesus Christ." About "A Little Book For New Philosophers (Little Books Series)"
Paul Copan (Ph.D., Marquette University) is Pledger Family Chair of Philosophy and Ethics Palm Beach Atlantic University, Florida. He has authored and edited a number of books including True for You, But Not for Me: Deflating the Slogans that Leave Christians Speechless (Bethany House), That's Just Your Interpretation: Responding to Skeptics Who Challenge Your Faith (Baker), co-authored with William Lane Craig, Creation ex Nihilo: A Biblical, Philosophical, and Scientific Exploration (Baker Book House) and Jesus' Resurrection Fact Or Figment? (Intervarsity Press), and most recently When God Goes to Starbucks: A Guide to Everyday Apologetics. part I: Why Study Philosophy?